Home » Blog » For Buyers » Raw Land Making a Comeback? Over the past couple of years, there has been a definite trend of houses selling and raw land not so much. This high season has started off with a bang with a slightly different tone. Raw land is in an uptrend. Lord knows why this shift, but here’s some of this blogger’s speculation on the matter. However, before I get to that meat, allow me to digress just a bit. A little history: Costa Rica’s southern Pacific zone used to be the edge of the known universe. When you arrived here, you had the feeling that you were stepping back in time. The roads were at times impassable. Whatever infrastructure there was, delivered spotty service at best. Each of the coastal towns (Dominical, Uvita & Ojochal) had at least one public phone that would frequently have a line waiting. Nature was king and would dictate the conveniences that were available at any given moment. When a heavy rain would hit, or if there was some wind (a rarity here in The Zone), the power would go out for hours while ICE (pronounced ee-say) set about fixing the lines damaged by a falling branch or tree. Sounds like ancient history, right? My real estate career started in 2004, and what I am describing is from that time and on a few years, so we really aren’t going back all that far. The changes here in The Zone over the past 10 years have been the most dramatic that I’ve ever seen in the “progress” department. I moved to Colorado’s Aspen valley in 1979. Over the next 20 years I saw what could easily be described as “dramatic” changes there. Aspen was a quaint mountain ski town when I arrived. By the time I left the area for Costa Rica, the saying about Aspen was that “the billionaires are pushing the millionaires down the valley”. HUGE changes, but what I saw there pales in comparison to the changes that have occurred here, especially in Uvita, over the past 3 – 4 years. Returning to Costa Rica: in the early days just getting to The Zone was a challenge. The coastal route was the least desirable and the Pan-American route over the mountains in the center of the country was an extraordinarily beautiful, but harrowing drive. The process of “getting here” acted as an effective filter to the “type” of visitor that would end up here. All of these could be typified as “hardy” and powerfully independent and individualistic. Thinking back over the intervening years, I would say that roughly 4 out of 5 of the folks that walked into my real estate office would say that they were looking for a house to buy here in The Zone. Of these, nearly all would end up buying raw land. The reason? There simply wasn’t much inventory of houses. Granted, there were some, but these available houses were generally designed as expressions of individuality on the part of these intrepid souls that were of the “unique” variety, resulting in designs that were difficult to sell to the general market. Now we fast forward to the 2013 season: access issues greatly improved, most “modern” services readily available. Still, 4 out of 5 folks walking into a real estate office would declare that they were in search of a house (the thought of building a house in a foreign land just doesn’t appeal to that many people.) At this point, we had a nice selection (read: an inventory) of nicely designed, ocean view houses, and they began to sell. The effects of the recession were fading and people had money to invest for the first time in years. Raw land sales began to take a back-seat to house sales. By way of an example, check out this recent Ballena Tales ad by my former Guys in the Zone partner Rod (we are still very much partners (read: buds). We’ve simply moved on to different offices. Rod designed this ad. It makes me want to have a house to sell just so that I can list it with him! 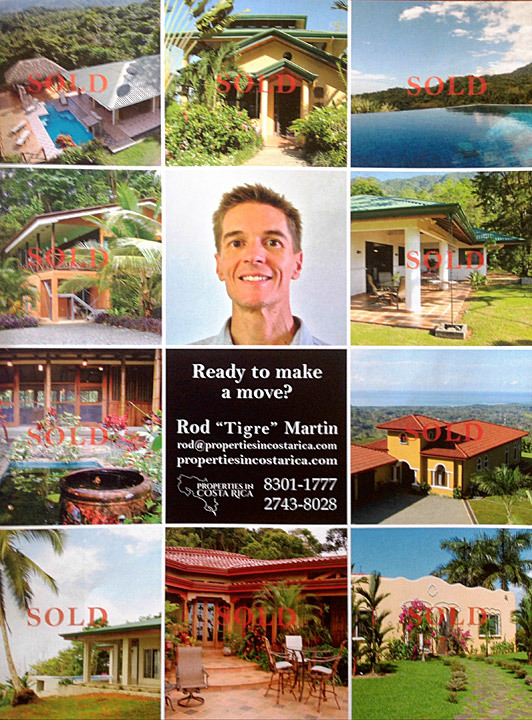 Now come up to the start of the 2015 season: Rod is still busy selling and listing houses and raw land. I’ve currently got one house under contract, but the majority of my business so far this season has been with raw land. Other agencies concur. There has been a clear uptick in the interest in buying and holding raw land or buying and building. To say that the market is “hot” might be overstating it, but I’d say “strong” is an accurate descriptor. The current market conditions are pulling some previously taken-off-the-market properties out of storage. The big demand is for ocean view properties. The view criterion is one of the primary evaluators, meaning, the bigger the ocean view, the higher the price. There has actually been some talk recently about how the inventory for the big view properties is getting mopped up. Investment Strategy: take advantage of the current low market value of raw land. All indicators suggest that we’ll see a firming of raw land prices, and then a rational increase in their value. Building a spec home is a promising strategy with raw land values at their current levels. So, for the person interested in buying a property in Costa Rica’s southern Pacific zone, the question is: is the raw-land comeback a trend, or merely a blip?